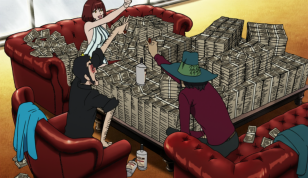 Synopsis: Lupin, Jigen, and Fujiko inflitrate a high stakes gambling boat owned by the yakuza to rob them of their lucre. However, as usual, the heist becomes complicated, when a large man with metal teeth targets our merry band of thieves and slights the honor-bound Goemon who was hired to protect the casino. While this steel-capped assassin, known as "Hawk", is after Lupin's life, Goemon is after his, determined to avenge the man who hired him. But Hawk proves to be more than formidable, he's actually more skilled then our favorite samurai friend! Can Lupin evade the "Ghost of Bermuda" long enough for Goemon to make him a real ghost? Or will the gravestones made by Jael Okuzaki be fulfilled? Leave it to Goemon to cut through the uncertainty (and a lot of flesh) with deadly precision! Once again, Takeshi Koike of Redline fame, and writer Yuuya Takahashi, bring us a beautiful, if a tad disturbing (and beautifully disturbing) Lupin III feature which in about an hour gives us basically everything the Lupin franchise needs to be now. It's got character, it has energy, it has just a little gravity, some humor, masterfully done action, and a touch of the patented Lupin sneering sleaziness (though not as exploitive as in Jigen's Gravestone). The title lives up to its name, too, because this movie is just soaked with the red stuff. It's not entirely clear when in the Lupin continuity that began with the TV series The Woman Called Fujiko Mine that this feature takes place during. 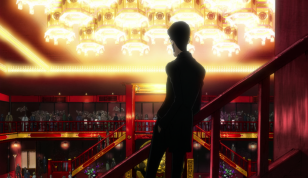 The TV show and subsequent movie basically left the characters in the situation we see them in at the beginning of the first TV series: that is, Lupin and Goemon are partners in crime, sometimes with Fujiko, and while Fujiko has met Goemon (and he considers her his girlfriend), Goemon has never met Lupin (and his only meeting with Jigen was when they couldn't see what each other looked like). But at the beginning of this movie, Goemon is keenly aware of who Lupin is and Lupin likewise immediately recognizes Goemon (though he did have his file in the previous feature). Does this take place after Lupin's initial encounter with the modern samurai, wherein Goemon attempted to kill our favorite lurid larcenist? He doesn't seem to have teamed up with the gang yet. This obviously takes place after Jigen's Gravestone, because Hawk is sent after Lupin, Jigen, and Fujiko to wrap up the loose ends of that case, and Zenigata seems to recall seeing those tombstones Okuzaki crafted for them. 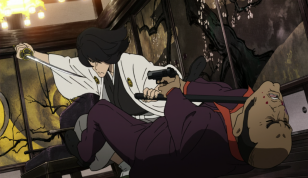 It doesn't seem like the first time ever that Lupin has physically encountered Goemon, but if that's the case, why wasn't he with them in the previous feature? Not that he needed to be. In fact, not every one of the characters needed to be in this feature. Jigen or Fujiko are great for Lupin to play off of with his brash, deliberate self-assuredness, but as the two of them largely play the role of "Lupin's buddy who's along for the ride", the feature probably could have excised either (or both) of them in favor of Lupin co-investigating with Zenigata in one of their legendary temporary truces. As it is, while we get to see Lupin's comical exasperation at Hawk's persistence, there's not a whole lot for either Jigen or Fujiko to do (though Fujiko does smoke a bong in one scene... hey hey hey, smoke weed every day). They seem to spend a lot of time helping Lupin play Exposition Fairy. Zenigata, at the very least, has a bit of an arc here, or maybe just part of one that we'll see continue in future features, which is his frustration over the cynicism, if not outright obstructiveness, of his superiors. Even without the foundation laid in the Fujiko TV series that Zenigata was fed up with a police corruption he was once a part of, you stil get a good sense of Pops trying to mete out justice in a world so backwards he often has to team up with thieves to balance the scales against greater evils. 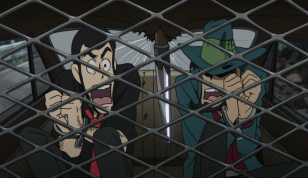 Just a short exchange between Lupin and Zenigata in his cop car gives him more character than Jigen or Fujiko combined, and he's cleary given more to do than them throughout, which is especially great since he only showed up at the very end of Jigen's Gravestone. I actually hope the next feature revolves around him, perhaps bringing Oscar back for a swan song. Most of the feature focuses on the Lupin gang's workhorse, the man who can cut pretty much anything, to the point of being almost supernaturally good (and thus using him sparingly is usually good as to not remove all tension), Goemon Ishikawa XIII. He starts off seeming pretty certain of the superiority of his skills, even having a passive-aggressive, humble-brag attitude. 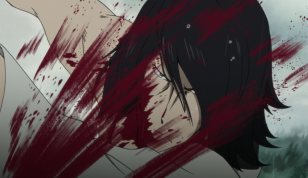 However he's knocked completely off balance by being confronted by an opponent who can not only put up a fight against his unnatural swordsman ship, but is able to counter him, even to the point of psyching him out, completely demoralizing him. Goemon spends much of the second half of the feature obsessing over regaining his composure and sorting out how to overcome his limits to defeat Hawk, even if he has to brutalize himself to do so. With Goemon, it's all about his iron will. 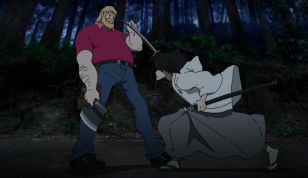 Hawk, for his part, has his own unique quirks that can liken him to Jael Okuzaki from Jigen's Gravestone, but different enough to not appear just a copy. They're both professional killers who've been sent after the Lupin gang from some greater force (presumably the masked organization from Jigen's Gravestone or perhaps Howard Lockewood/Mamo). One of the best scenes is how Hawk is described as having stolen a motorcyle after enjoying several orders of ribs. The little gestures he makes as he eats, relishing his food, licking his fingers clean and chugging a beer. He's a man that, unlike Okuzaki, isn't sophisticated. He just wants the thrill of the hunt, food, drink, and sleep. He's not interested in invention or ostentatious living (it's possible that fancy house in the beginning isn't even his, given that the little girl refers to an "owner" giving him his job). I think the main draw of the feature, however, is obviously all the violent action. Goemon isn't cutting mere worthless objects here (though he does some of that), but a whole lot of flesh and bone, severing limbs, arteries, and other body parts. When the yakuza cross him, he says, "screw 'em" and uses them as target practice as a warm-up for a rematch with Hawk. 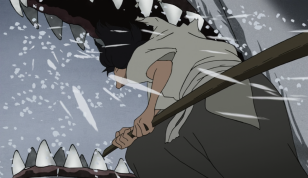 In gorgeously animated gory detail, we see why Goemon is the most physically intimidating member of the Lupin crew as his blade slices through thugs like a hot knife through butter. It's a messy affair, to say the least, to where you almost pity them. Almost. Perhaps Blood Spray isn't as tightly woven and balanced as Gravestone, taking a more obvious visuals preference to storytelling and characterization, but there's still some of that. Anything that expands the road that began with the Fujiko TV series with the style and boldness of Koike is satisfying enough for me, and I hope to see more in the near future. Meanwhile, I'll be waiting for Discotek to license this and perhaps dub it. Though I can't imagine who'll be in the dub. That's an interesting subject to speculate on, though. So, if you're a Lupin fan, especially a fan of the Yamamoto/Koike-verse, this should be seen. Anyone else should watch it just for the visuals, because it's still worth it. This feature is far from a worthless object.